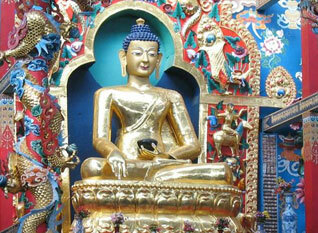 Namdroling monks are currently in Bodh Gaya attending the Great Prayer Festival for World Peace, Monlam Chenmo. To find out more about this event, please visit http://www.nyingma-monlam.org. You can also see the latest updates here on the right, from Twitter, or just follow us! May all be auspicious! On the 22nd day of the ninth month according to Tibetan Lunar Calendar is considered in Tibetan Buddhist tradition as the auspicious day of Lhabab Duchen or Buddha’s Descent from 33 Heaven. Buddhist scriptures emphasize the importance of all the auspicious days related to Buddha Shakyamuni’s main activities like holy birth, supreme enlightenment, sublime parinirvana, turning of the wheel of dharma, descent from heaven, displaying miracles and so forth. It is believed that if one engages in virtue during these occasions, one’s merit gets multiplied manifold and if one engages in non-virtue, the same applies. 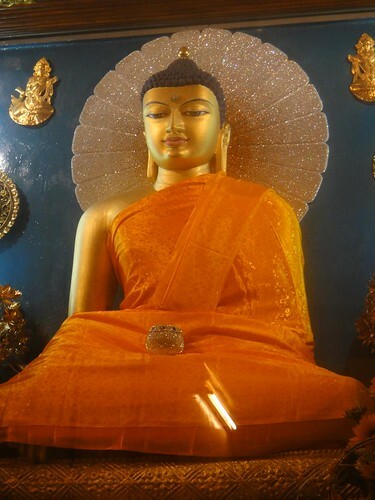 Hence, throughout Buddhist history, followers of Lord Buddha have engaged in wholesome activities through body, speech and mind according to their capacities and have abstained from non-virtuous actions, and even more so on such holy days. Remembering the sublime qualities of Buddha’s enlightened body, speech and mind, if one engages in any virtuous activity during Lhabab Duchen with an intention to achieve good rebirth in the next life, liberation or supreme enlightenment, one’s merit will get multiplied one hundred thousand times making it possible to achieve one’s objectives swiftly. Following the law of cause and effect, one should engage in virtuous actions of the three doors and abstain from non-virtuous actions which will help one to be born in human realm in future lives. Following the path of renunciation, one should meditate upon the view of selflessness of individual to achieve liberation. Following the path of the Greater Vehicle or Mahayana, one should generate Bodhicitta and engage in the six perfections. Following the path of Vajrayana, one should practice the two stages and generate the pure perception of viewing all appearances to be deities, all sounds to be mantras and all thoughts to be display of dharmakaya. In this way, not only will our accumulation of merit will be stronger, but also purification practices like meditating upon Vajrasattva or reciting the one hundred syllable mantra will be effective for us. Hence, all students are advised to accumulate all the possible virtues and abandon all the non-virtuous thoughts, speech and actions according to one’s capacity during this special time.